The Dent: Update: Tori DOES appear on the Hurricane Katrina Fundraiser CD from Target! Update: Tori DOES appear on the Hurricane Katrina Fundraiser CD from Target! Updated again: I have new reports from Greg Madsen, Chris Strawbridge and Jessica Slusher that tell me that Tori is indeed one of the artists on the newly released Hurricane Katrina Fundraiser CD from Target called Sound Response! However, you will not see her name on the back of the CD. The track listing there claims that track #10 is from Lenny Kravitz. However, if you open the CD and play it, you will see that Tori's A Sorta Fairytale is in fact track #10! Tori is also listed on the track listing that is inside the CD. The Tori track is from the September 4, 2003 West Palm Beach, FL concert at the Sound Advice Theatre, and was also featured on the Welcome to Sunny Florida DVD. So NOW it appears that the information at target.com is in fact correct. (This has all been so confusing!) So once again, despite the fact that Tori is not listed on the track listing on the back, she is in fact on the CD as track #10. Hopefully, they will print new copies of the CD with the correct set list on them! This fundraiser CD is a compilation of 16 live tracks from different artists. 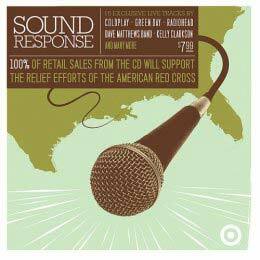 100% of retail sales from the CD will support the relief efforts of the American Red �ross. The album is called Sound Response and is only be available at Target stores in the U.S. or online at target.com. The album was released on November 1, 2005. You can find out more about it at Target.com. Radiohead "Everything In It's Right Place"
Jet "Take It Or Leave It"
Rob Thomas "I Am An Illusion"
Tori Amos "A Sorta Fairytale"
Goo Goo Dolls "Give A Little Bit"
Ben Harper and The Blind Boys Of Alabama "I Shall Not Walk Alone."